Disclosure: Although my trip was sponsored, all opinions are my own. Planning a family getaway can be a huge expense on many families. Fall travel is a great way to enjoy discounts on affordable accommodations and discounted attractions. 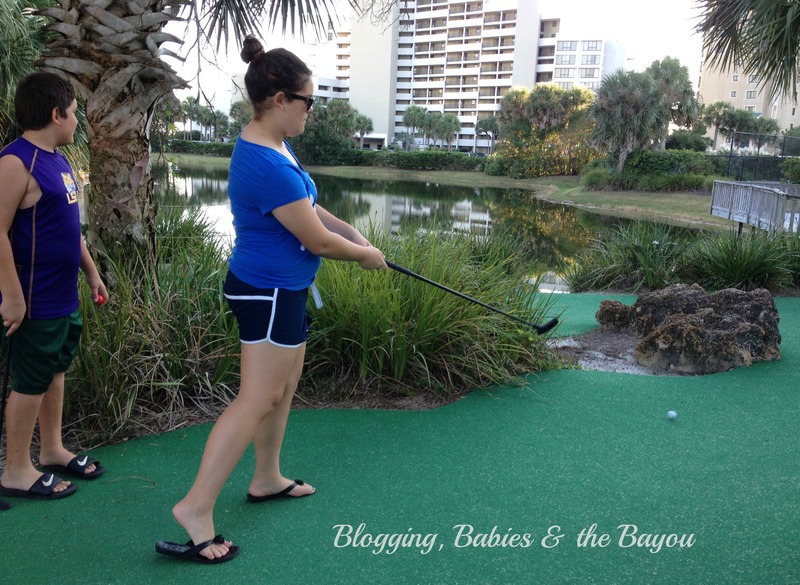 What I loved about Sandestin Golf & Beach Resort is that many family friendly activities are complimentary resort amenities for registered Sandestin guests. On our recent stay at Sandestin, my husband & I both took off of work Friday in order to leave on a Thursday evening & return Sunday afternoon. Since we missed work, that means we also lose income our family needs. This is exactly WHY we too advantage of all the free amenities available to resort guests. 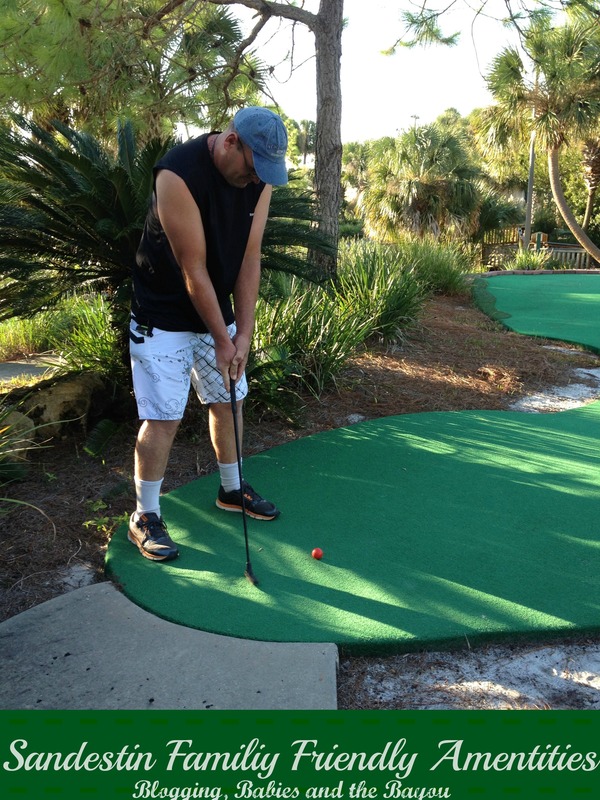 Families can Putt their way to the finish line at Sandestin’s beautifully designed mini golf course themed after Florida’s coastal, evergreen and wetlands landscapes. 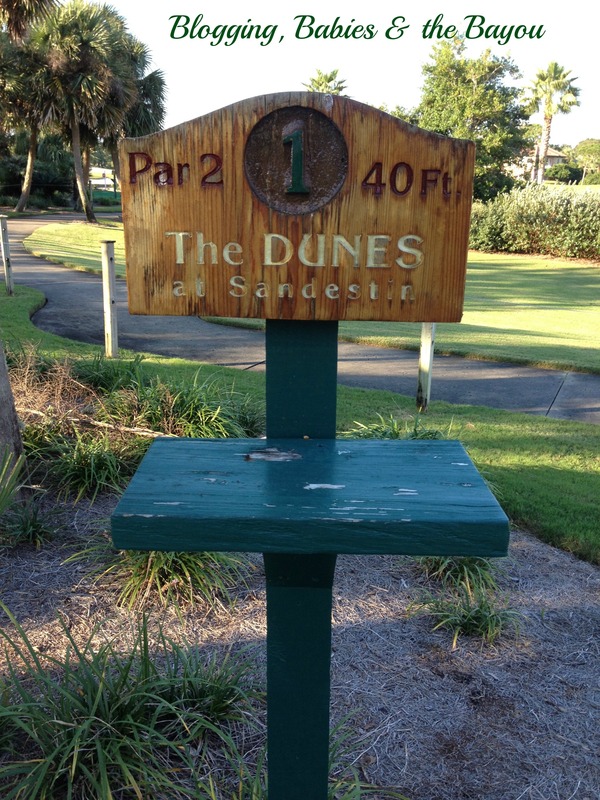 The Dunes Putting Course is an exclusive amenity for Resort Key Card, Amenity Card and Club Card holders (Sandestin Guests, Hilton, Bayclub, Marriott, Club Intrawest). During fall & winter months, putters can be picked up at guest registration and is located at Beachside Green on Sandestin Boulevard South just beyond the south Security Guard Station. It was a short walk from our condo but depending on where you stay, you can easily take the free shuttle directly to the Dunes Putting Course. Young children and teens can enjoy a few hours of family fun with their parents as we did. Our family spent Friday morning enjoying the beach and pool until lunchtime. We then grabbed a quick bite to eat and take a VERY long (much needed) nap. Once we awoke we decided to hit the Dunes Putting Course for an hour or so until we took the free shuttle to The Village of Baytowne Wharf for dinner and more family fun. Saturday morning after breakfast in the condo we decided to rent bikes at the Marina and take a leisure bike ride through the golf courses and other communities in Sandestin. Shuttles to the Marina and other areas start at 10 a.m so we were ready to take advantage of the free shuttle and save our gas for our drive home. The bike rental area has a large selection of options for your family. 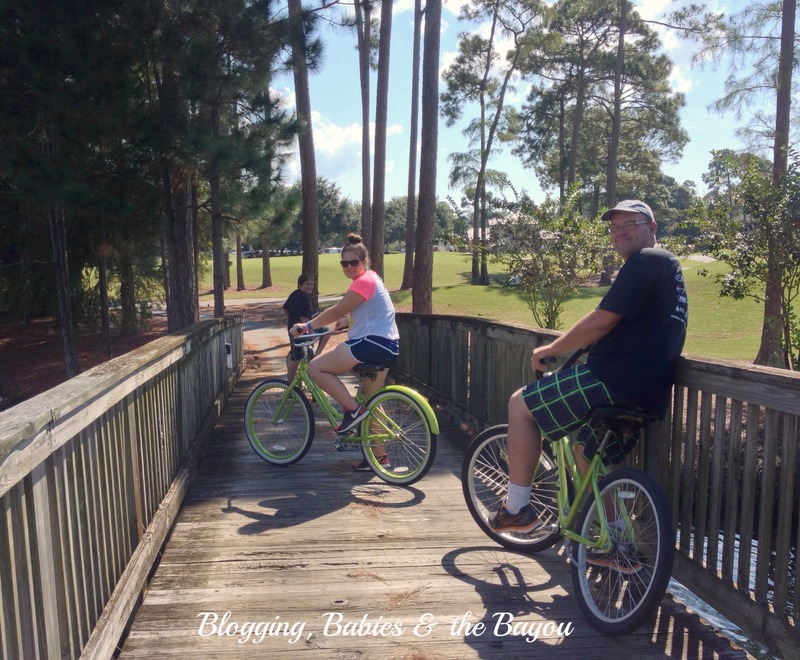 Whether you need to pull a bicycle trainer for your young toddler or a child seat attached to your bike, the Bike Outlet has the perfect bike for your family at no extra cost for resort guests. Let’s just say I am not as fit as I would like to be. Renting bikes was a great idea for our family. The entire family (including myself) needed to exercise and enjoy the calmness of a bike ride. 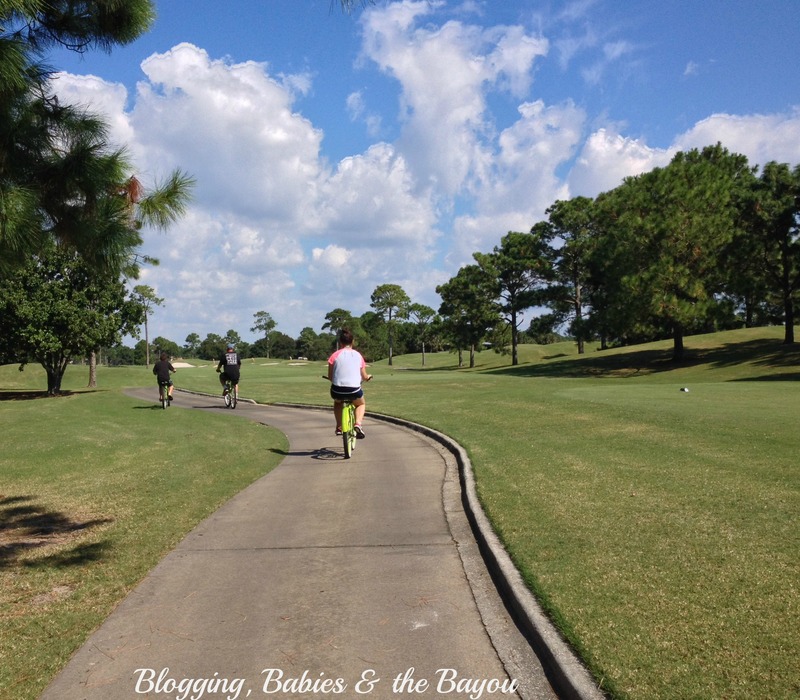 We rode throughout several communities, to the a gold course and back to The Village of Baytowne Wharf for a quick bite of lunch. Next thing we know, we spent several hours as a family without our cellphones (except for the pictures I took), television or Itunes music. The Bike Outlet is open daily, 9:00 a.m. – 5:00 p.m. and is located in the Baytowne Marina. 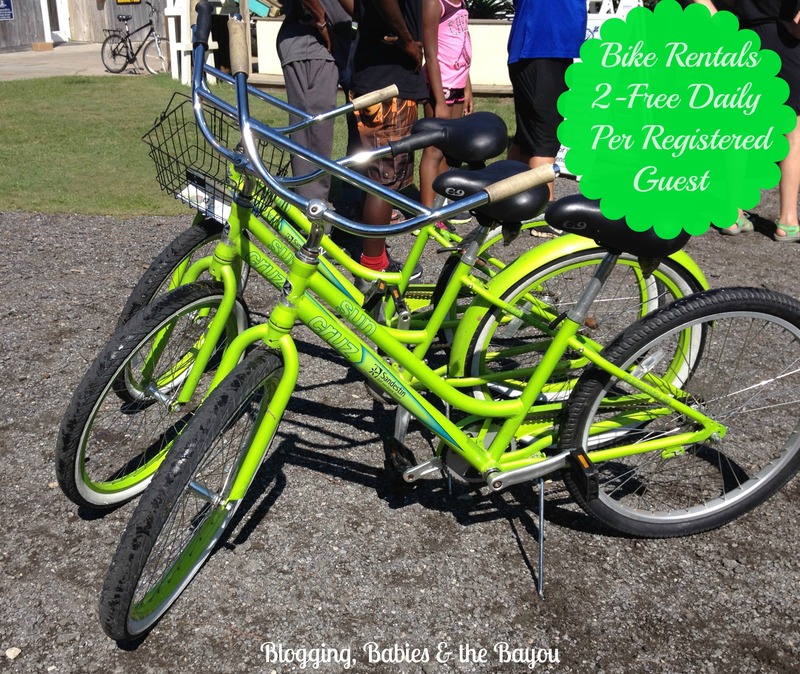 Resort Guests receive Two (2) complimentary 4 hour bicycle rentals each day of their stay, per unit. You can rent additional bikes if 2 is not enough. What is your favorite family based activity when traveling? Looks like a great family getaway! My kiddos are still a bit small for this but I can not wait when we can all bike ride together. We always look for a place with a wonderful pool. My kids love the water! Wonderful family getaway. I wish the weather here in northern Minnesota was still warm and sunny. That looks and sounds like a wonderful, relaxing little getaway. I really love the bike rental idea that is a lovely way to spend an afternoon. This is definitely a great “capture the family moment” moment. It’s lovely to see something like this. It encourages family togetherness. Lovely pics. I’m a huge fan of golf and biking! This is where I need to be! That looks like a great fall getaway! Lots of fun too! If you want to see what FALL really is, you need to come to Canada and check out the changing of the leaves. Its gorgeous! Love it! Too many vacationers don’t realize what their resorts have to offer and end up spending tons of money away from the resort trying to ‘find things to do’. For a really relaxing vacation, go to your resorts, rest and explore what is there for you!!! I love when resorts have great things for guests to do. I have not seen one yet that let you take bikes if you are a guest. Love that idea. How fun!! I love active vacation ideas for families. Looks like you guys had a great time. Looks like you had an amazing time! :)) Wish we could still wear shorts in October in my country..
what a fun family getaway. regardless of the place, and location family outing always work out fine. the idea that you and your family find time to bond and do all kinds of activity is really fun. this kind of thing don’t happen too often. The bike ride looks great. Sounds like a lovely way to get away and I love the activities you found to do while there. Definitely looks like a lot of fun! I love resorts exactly for the reasons you mention..amenities! Free bike rentals is an awesome one. Hope you had lots of fun! I love these amenities, especially the mini golf. I am always traveling to Florida, I would love to visit sandestin one day. That place looks amazing!! I quite enjoy a mini golf game, that course looks like a lot of fun. Beautiful resort! I’ve never stayed at one before. Looks like a lot of fun.